This photo reminded me how much joy I get creating handmade cards and giving them to family and friends. For many years I've preferred to create cards (when I plan ahead) because they're fun to do and are always received well. And you know it's really much easier than you think. With computer card software being so popular, you can get pre-folded blank cards, complete with matching envelopes at any office supply or Target store. Most stores will have simple colored pencil kits, and as for pens, the Pilot G2 and Uniball Signo 207 work well. I recommend sketching out your idea in graphite pencil very lightly, then draw over the pencil with the G2 or Signo's black gel ink. Erase the pencil. Color the card with the colored pencils, or if you wish, keep it black and white like my card above. "Rohde Cards: When you're too cheap to send the very best." 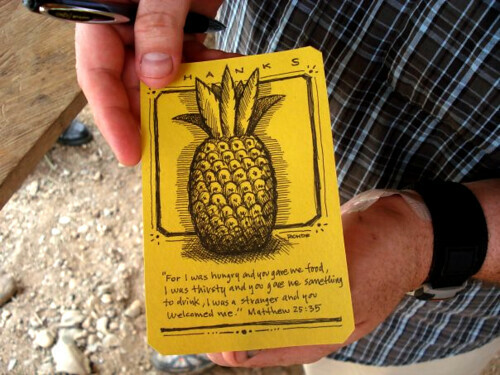 As for the story behind the handmade card above, I was in Belize in July 2007, as a part of a church service group. A small team from the larger group paid a visit to a Mennonite family in the village of St. Margaret's, in the mountains of Belize. The family we visited was incredibly hospitable to our team. They offered fresh pineapple juice and friendly conversation at their home overlooking the river, high on a hillside. I wanted to say thanks, but what can you offer a Mennonite family they don't already have — or will accept? With this in mind, I drew up a little thank you card on spare construction paper, had our entire group sign the back and sealed both sides with leftover clear contact paper. Our team presented the card to the family, which they loved. Go Forth and Create Handmade Cards! So, visit the store this week and get your supplies for Mother's Day! Your mom will adore your handmade work, regardless of your drawing skills. Remember, it's not about your skills as an illustrator, it's about sharing from your heart! Your drawing style on the postcards and sketchnotes etc rally makes me wish I would have kept on drawing in my early years. Now it should be "Rohde Cards: When you're smart enough to send the very best." Been a while since I popped into your site to see what you have been up to. Awesome share bro! You reminded me of how much I enjoyed doing the same kind of thing at Christmas. I don't sketch quite as nicely as you do but I have 2 boys that live in another state so with my 3rd son we had a blast creating a massively oversized card complete with a 20 page story inserted in. A lot of time was spent crafting the story and I did a sketch for every other page, letting my 6 year old draw the other pages.. It was crazy time consuming but making something for someone is just as rewarding, if not more, than receiving it. Also, you're right in what you are telling Ove. Some people just simply lack the patience and the ability to learn certain skills but if you have a genuine interest and an eye for detail you can always learn to draw. Having resources is useful, but the best way to learn is by leaching off more talented people. Oh, BTW, you should see this awesome pineapple I drew. I made it all by myself and even put a nice border around it with my favorite bible verse.--j/k -- Except about the verse, I love that one.